Attendees can park in the south visitors lot. Overflow parking is available in the north employee lot. 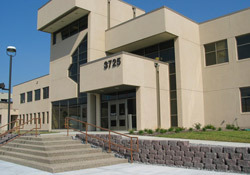 The building is handicap accessible and all conference rooms are located in the lower level. An elevator and stairway is available to your left as you enter the south main front entrance. Computers are available in the commons area for checking e-mails, and vending machines for beverages and snacks. To make a conference room reservation, fill out a completed reservation form and email it to stcloud.conference@state.mn.us. A room confirmation number will then be sent to you. Reservations must be made at least two weeks prior to an event. Smaller events consisting of eight individuals or less need to be scheduled at least 48 hours prior to the event. The largest room seats 177. The facility also includes a computer lab equipped with 10 student stations and one instructor's station. What the facility offers. For local information on hotels, transportation and dining visit our resources page.